The Tools in the Toolbox. During my formative years, as a Boy Scout, and later in life as a mechanic, I have learned about tools. As I grew into the person that I am today I have learned about and used a great deal of tools. How to take care of tools and put them to the proper use. What the tools were designed for and how to use the tool properly and not irresponsibly. I know for example that a screwdriver should be never used as a pry bar or a chisel because it can bend or break, causing damage to what you are working on or even hurt you or someone else. During my time in the Navy as a cook I learned about the tools of the trade, the utensils and the appliances. As good fortune would have it I was well educated in the culinary art and was told by my educators that with the skills that I had acquired I was likely a better cook than 99% of the people on the planet. Having lived a full life and traveled a great deal I have used that skill and experience as a benchmark for how I evaluate cooks, chefs and restaurants. If I could have prepared the meal better at home I rarely go back to that restaurant. Being that the food is only as good as the experience of the preparer. In 1973 I had the opportunity to participate in a newly introduced class in Automated Business Machines. The tools were the newest technology of the day to date and I was awed and fascinated by IBM computers, Xerox copiers and Motorola phones as well as a calculator, that we had one of to share and learn about. Those tools and their offspring are part of our everyday lives today, but in 1973 it was magic and wizardry. I find it funny that even today I am able to educate people in the use and care of these machines based upon what I learned 40 years ago. There are other tools in the toolbox that some people forget are tools. Professions are merely the application of skills and manipulation of those tools that give us a paycheck, another tool. By definition the cars, homes and money that people cherish as symbols of status have become, to often, “Ends instead of means to Ends.” The car in the driveway is not who you are it is a transportation tool. The home you live in does not make you a better person, it is a shelter. The money in your wallet or the credit score you have established are not what makes a person more or less worthy of consideration or accreditation. These are tools that when used properly for some benefit and in the hands of someone as a means to an end are very helpful. But the tools can be misused as well and can be damaging and hurtful just like any tool that is used improperly. A new Climate Model Shows a Warming Planet. Meaning Less Cloud Formation and Which in Turn Contributes to Increased Temperatures. That means that the TEMPERATURE rise will very likely be in the neighborhood of (7.2 degrees f.) or higher. Also the EQUIVALENT temperature change can be INFERRED that if warmer temps are warmer, then colder temps are colder; Right ??? This story originally appeared in the Guardian and is reproduced here via the Climate Desk initiative. Temperature rises resulting from unchecked climate change will be at the severe end of those projected, according to a new scientific study. The scientist leading the research said that unless emissions of greenhouse gases were cut, the planet would heat up by a minimum of 4°C by 2100, twice the level the world’s governments deem dangerous. The research indicates that fewer clouds form as the planet warms, meaning less sunlight is reflected back into space, driving temperatures up further still. The way clouds affect global warming has been the biggest mystery surrounding future climate change. “4°C would likely be catastrophic rather than simply dangerous,” Sherwood told the Guardian. “For example, it would make life difficult, if not impossible, in much of the tropics, and would guarantee the eventual melting of the Greenland ice sheet and some of the Antarctic ice sheet“, with sea levels rising by many meters as a result. The research is a “big advance” that halves the uncertainty about how much warming is caused by rises in carbon emissions, according to scientists commenting on the study,published in the journal Nature. 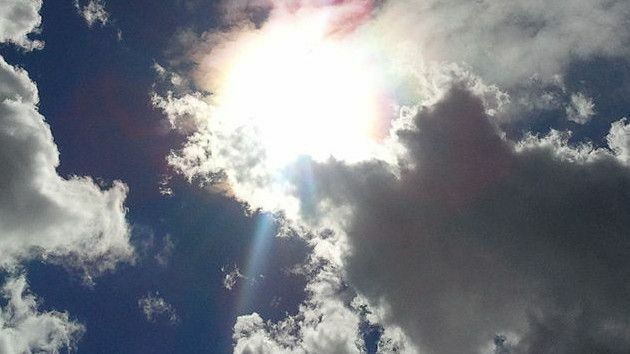 Hideo Shiogama and Tomoo Ogura, at Japan’s National Institute for Environmental Studies, said the explanation of how fewer clouds form as the world warms was “convincing”, and agreed this indicated future climate would be greater than expected. But they said more challenges lay ahead to narrow down further the projections of future temperatures. The key was to ensure that the way clouds form in the real world was accurately represented in computer climate models, which are the only tool researchers have to predict future temperatures. When water evaporates from the oceans, the vapor can rise over nine miles to form rain clouds that reflect sunlight; or it may rise just a few miles and drift back down without forming clouds. In reality, both processes occur, and climate models encompassing this complexity predicted significantly higher future temperatures than those only including the nine-mile-high clouds. Global average air temperatures have increased relatively slowly since a high point in 1998 caused by the ocean phenomenon El Niño, but observations show that heat is continuing to be trapped in increasing amounts by greenhouse gases, with over 90 percent disappearing into the oceans. Furthermore, a study in November suggested the “pause” may be largely an illusion resulting from the lack of temperature readings from polar regions, where warming is greatest. Hampus Wennberg /Wikimedia Commons, The Guardian, The Climate Desk initiative. One more day. ONE MORE DAY. I tell myself that I can do this, one more day! I know that life is hard, difficult at times. I know your life is hard and difficult as well. That isn’t the worst of it. The way that I see life is as a challenge. Mostly because it is, and partly because if I didn’t, I might give up or give in to the, ” Life is not worth living; if this is living,” mind set. There is an, ” As good as it gets,” tone to my life and you may also be living in that dimension. The reasons have come through living in the last half century and dealing with the trials and tribulations of never taking the next step-up the proverbial financial ladder. Try and try again, as I have, and failed. Failed to become part of the haves and destined and resolved, admittedly, that I will never be anything more that what I am. The hopes and dreams have been put to rest and even the want of acceptance. I have fermented and matured in anticipation of becoming a fine vintage wine, only to become vinegar. Now you may say,” This person doesn’t sound very optimistic. ” In that you would be incorrect. All I have is optimism. I have no time or place in my life for pessimism. If I choose to be negative over positive, I am the one who looses out on the joy of life. If I choose to give up or give in, I bring no joy to my fellowman, only sorrow. So I have learned to enjoy the sunrises and sunsets of my life for what they are, not for what they might have been. I have not always driven a straight line or followed directions from point a to b. I have wandered, zigged and zagged and gotten lost a few times. If I was asked to predict where I would end up, this location, time and space would not have been my first thought. As I have driven along through life I have sustained a few dents and dings. Character builders. You may have some as well. Mine are not all external, many are, but most of the wear and tear is under the hood and on the interior. There is a stupid old saying that goes something like, “The world may be coming to an end all around you , but as long as you’ve got your health, things aren’t so bad.” Just thinking about it makes me grit my teeth and lock my jaw and crinkle up my forehead. I didn’t have much, never more than a pay check to pay check life. I have never had more than enough of anything and eh… I was OK with the status quo. Maybe not OK, but at least not fed up enough to go postal. Then I lost my health and all the teeny tiny things that used to bother me now became great big drive me to the brink, things. The loss of something that I had taken for granted has broken me. Because I had no concept of not being able to do the things people do. That hurt, that injury, if brought on by reckless or careless living may not have bothered me in the same way as having it just happen. That bothers me, that there is a grief stricken person inside me that still remembers when he could do everything also bothers me. Twenty years, I cannot get my head around the thought that it has been twenty years since I was able to play ball or bowl or participate in any sport. Twenty years of one more day. Twenty years of living day to day, in near poverty. Twenty years of pain and everyday feeling less and less useful and more and more useless. Twenty years of looking for and loosing jobs. Twenty years of continually diminished return on investment. That is not good for the soul. Twenty years ago I was working a job I loved. Had a good income, a wonderful family and I also still had dreams. Then I got sick. My intestines had tied themselves in a knot and I nearly died. The recovery took months and the thoughts that kept me going were all about getting back to where I had been. My families needs had to be met. My job had to be salvaged. My home needed to be maintained and I was never fully able to satisfy any of those needs ever again. I didn’t loose it all overnight. I lost it a little bit at a time. The medical bills and the constant pain, plus the wear and tear on my emotions. These were complications and catalysts that made one more day more difficult to complete. I didn’t know it then but I was becoming less friendly and more callous. I was becoming less responsive and more apathetic. I didn’t know it then but a little bit of me was dying everyday. I couldn’t stop it because I didn’t know it was happening. After loosing my dream job and unable to recover my self-esteem I worked a manual labor job in an effort to keep my family together and keep my head above water. It ended with the sale of the house I had worked for over a decade to make just right and a geographic move south looking either to escape my past or find a new future. The loss of a persons health changes more than the person with the poor health. It changes, it touches, all the people around the individual. We in society don’t live in a vacuum. My life affects yours and your life affects every person that you come in contact with. The contagious nature of life builds and destroys daily. I know that now; I wish I knew it then. It took four more years for my family to come apart. Four years of my not being able to satisfy the needs of my loved ones and four years of trying to make it one more day. At 34 years old when I had my first major surgery I was fortunate enough to have insurance. Although having insurance doesn’t save you from the loss of your health nor does it protect you from the loss of your job. When I lost my job not only was I heartbroken,but I had lost the protection of insurance. I was only able to maintain Cobra insurance for two months because of the high cost. After that I was at the mercy of the insurance industry and their preexisting condition rules. At 44 when I took ill again, this time due to an abcess in my pelvis that was the size of a Florida grapefruit I didn’t have insurance. I also didn’t have the benefit of highly skilled physicians capable of performing the surgery and I suffered a great deal due to the inadequacies of the rural southern medical care system. Without the compassion of one nurse who told me in confidence and off the record that the doctors had no clue as to what to do and how to save me. My death was imminent unless I transferred to another hospital, at my own expense…Yes, Cash… I had to pay cash in advance in order to be transferred to a big city hospital. I barely made it out of there alive and had hundreds of thousands of dollars in medical debts that until I was totally broke and without assets of any kind was held over my head. Every time the phone would ring I died a little bit more because I knew that there was someone on the line demanding money. For two years I had bags and tubes hanging off of me until I was without assets and able to have another surgery courtesy of the VA, where I was assured success. 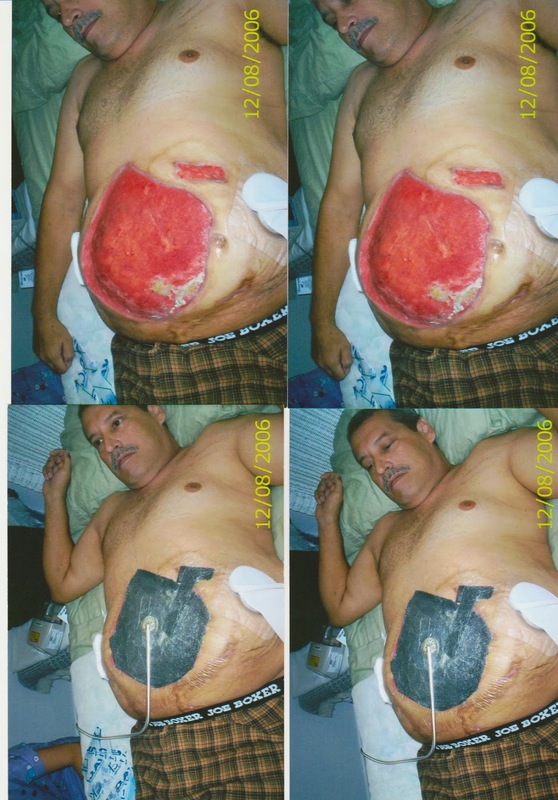 Seven days after my surgery my abdomen exploded. The outcome you can see in the photographs. I, being naive, applied for disability benefits and have been denied repeatedly. So I have bounced from bad jobs to worse jobs. Been unemployed, took buses to stand in food lines and suffer daily. One more day, one more day. There are people in this country who suffer from even greater and more heart wrenching illnesses than I do. There are those individuals who suffer from OZ Syndrome, they have no hearts, no brains, no courage. They are often seen to be pretending to care about you and the welfare of your kind, but they have compassion only for themselves. Every man. woman and child in this country and on this planet deserve a life worth living. Every man, woman and child should be granted Life, Liberty and the Pursuit of happiness. But there isn’t any part of this that speaks to those in need or in the need for tithe to help those in need. I used to be someone. At the very least I thought that I was making a contribution and that if even in the smallest way, I was helping to make life better for some. Highly skilled in all office machines and computer software/ hardware. Mechanically inclined, able to use all tools and measuring devices. April 2011- August 2013 Transworld Diversified Engineering, Tampa, Fl. Wood Park Pointe, I & II Arcadia, Fl / 73 units, USDA 515 property, HUD, SEC-8. Communication and Computer work as a Level II, USDA Rural Development Tax Credited and 515 Site Manager. their Benefits and backaches. I controlled Shrink and Damage and completed all Store Transfers of Merchandise. Quality control in the manufacturing of electrical components. Independent Online Broker and Sales Agent. CDL-A Truck Driver, Paving Machine Operator, and Maintenance Mechanic. Responsibilities included Safety, Training & Instruction, Accident Review & Employee Files. QualComm On-Board-Computer Training as well as FMCSA, DOT, and CFR and Transport Terminal OSHA requirements. Post Accident Investigations, including all Drug Testing Pre-Hire and Post Accident/Incident. Catering Service Owner/Operator. Banquets, Weddings and Hors d’oeuvre Parties. Operations, Production, Shipping and Receiving as well as physical plant maintenance. Sold and maintained insurance and financial services instruments. Auto/Home/Health/Life & Securities. Sole Proprietor of a Commercial Cleaning Service. Cleaned and Maintained three bars and two restaurants for a full two years. Qualified and proficient in all capacities, Cook, Bartender, Security, Balancing and Deposits. Berthing Petty Officer, Ashore, CTW-1 United States Naval Station, Meridian, Ms. Automotive Air Conditioning Technician and cooling systems mechanic. First class Scout, Attended and participated in all scouting functions for four years. Camping weekends, Honor Guard at High Mass. and candy sales, Sunday breakfasts and paper drives. Are we doing it wrong? Probably. In my opinion at least, the “Race to save the planet” is a failure. It isn’t a race. It is an obligation and a duty. My hope is that this page will be able to clarify what I mean and what I believe the route to success is. We the people have forgotten where we come from… Our history defines us and when we forget our past, we also forget that history repeats itself. We the people have also forgotten that we are evolutionary first and revolutionary second.